BEIJING, May 28 (Xinhua) -- President Xi Jinping on Monday called for efforts to develop China into a world leader in science and technology. Xi, also general secretary of the Communist Party of China (CPC) Central Committee and chairman of the Central Military Commission, said as China strives for prosperity and rejuvenation, it needs to devote great energy to promoting science and technology, and endeavor to be a major world center for science and innovation. 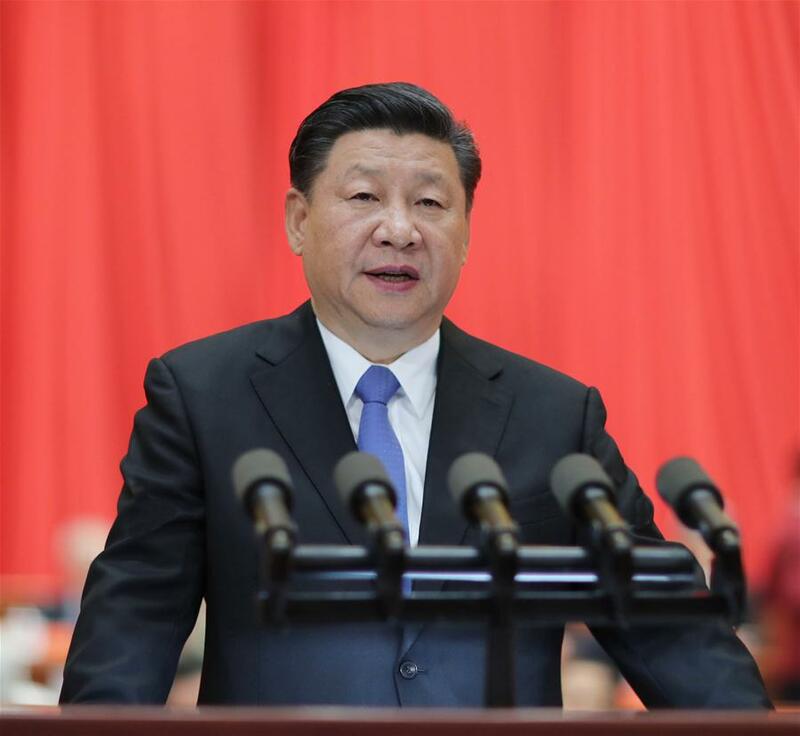 Xi made the statement at the opening of the 19th Meeting of the Academicians of the Chinese Academy of Sciences (CAS) and the 14th Meeting of the Academicians of the Chinese Academy of Engineering (CAE). Xi said the circumstances, challenges and missions are pressing. He called on the country's science and technology personnel to grasp the main trends, seize opportunities, face problems squarely, and rise to challenges. Xi said they should aim for the frontiers of science and technology, lead the direction of its development, shoulder the heavy responsibilities bestowed by history, and be vanguards in innovation in the new era. Members of the Standing Committee of the Political Bureau of the CPC Central Committee attending the meeting were Premier Li Keqiang, Wang Huning, who is a member of the Secretariat of the CPC Central Committee, and Vice Premier Han Zheng. Xi noted that since the 18th CPC National Congress in 2012, China has been adhering to the Party's leadership over the cause of science and technology, striving toward the goal of developing China into a science and technology power, sticking to the path of innovation with Chinese characteristics, inspiring creativity vitality through deepened reform, stressing the key role of talent in innovation-driven development, and integrating itself into a global network of innovation. Historic, holistic, and structural changes have taken place in China's science and technology sector. China's strength in this field is undergoing a transition from quantity accumulation to quality leap, and from breakthroughs in certain fields to improvement of systematic capabilities, Xi said. A new round of scientific, technological, and industrial revolutions are reshaping the world domain of innovation and global economic structure. The impact of science and technology on a country's future and the people's wellbeing has never been so profound as today, he said. Calling innovation the primary driving force of development, Xi said efforts must be made to ensure "high-quality science and technology" to underpin the development of a modernized economy. Xi required integration of the internet, big data, and artificial intelligence with the real economy, advance fundamental transformations of the industrial pattern and enterprise forms in the manufacturing and move Chinese industries up to the medium-high end of the global value chain. Xi called for unwaveringly carrying out independent innovation, having firm confidence and enhancing the capability in this regard. Noting that independent innovation is the only path for China to climb high in global science and technology, Xi urged courageous moves to reach for the "commanding heights" in scientific and technological competition and future development. Xi called for courage to explore the uncharted courses and realize the goal that key and core technologies are self-developed and controllable. "The initiatives of innovation and development must be securely kept in our own hands," Xi said. Also, Xi demanded greater efforts to research and plan for scientific issues that are of fundamental significance and overall importance. Prime resources should be focused and strategic planning made to deal with "key areas and stranglehold problems," Xi said, calling for breakthroughs at the earliest possible date in these fields. Xi urged overall reform of scientific and technological system, to improve innovation efficiency and inspire innovation vitality. Technological innovation should be accompanied by institutional innovation, Xi said. Xi called on Chinese scientists to be deeply involved in the global governance in science and technology, offer Chinese wisdom, and make greater efforts to promote the building of a community with a shared future for humanity. Efforts should be made to deepen international exchanges and cooperation, make use of global innovation resources, and establish partnerships featuring win-win cooperation to deal with common challenges concerning future development, food and energy security, health and climate change, Xi noted. While achieving its own development, China will bring benefits to more countries and their peoples and promote balanced development around the globe, Xi said. Xi encouraged integration into the global innovation network and enhancing opening-up of the country's scientific and technological plans, saying Chinese scientists are encouraged to actively participate in and lead international science plans and projects, and initiate and organize international scientific cooperative programs. Xi called for efforts to create a good environment for innovation, and mechanisms to foster talent and let everybody display their talent. The CAS and CAE should continue to play their role as the state strategic scientific and technological force and work with all in the field in the country to push for strides in development and scale new heights in science, Xi said. Xi urged the academicians to do forward-looking, targeted, and strategic research. Calling academicians a treasure of the state, pride of the people, and honor of the nation, Xi said he hoped they could gain continuous breakthroughs in key scientific fields. Party leadership is the fundamental political guarantee of advances made in the cause of scientific innovation with Chinese characteristics, Xi said. He stressed the role of youth in the future of the country and innovation. "Numerous children in China dream of becoming a scientist. We should make science an appealing career for the young," Xi said. Leading officials of the Party, the national legislature, the cabinet, the top political advisory body, and the military were present at Monday's conference. It was presided over by CAS President Bai Chunli. CAE President Zhou Ji delivered opening remarks. The event was attended by more than 1,300 academicians, representatives of outstanding scientists and grassroots science and technology personnel, officials from the central government agencies and the military, research institute fellows, and university students and teachers.